By Catherine Baldwin, General Manager, Suspended Animation, Inc.
Alcor Life Extension members now have access to nationwide standby, stabilization and transport services provided by teams of medical professionals through Suspended Animation, Inc., but some Alcor members may be unfamiliar with Suspended Animation, the company. Founded in 2002, Suspended Animation, Inc. (SA) serves cryonicists in the continental United States from all cryonics companies through contracts with individuals and their membership and long-term care organizations. SA is not a membership organization and does not offer long-term cryonics care, but instead focuses its efforts on research and development of superior equipment and services for cryonics. 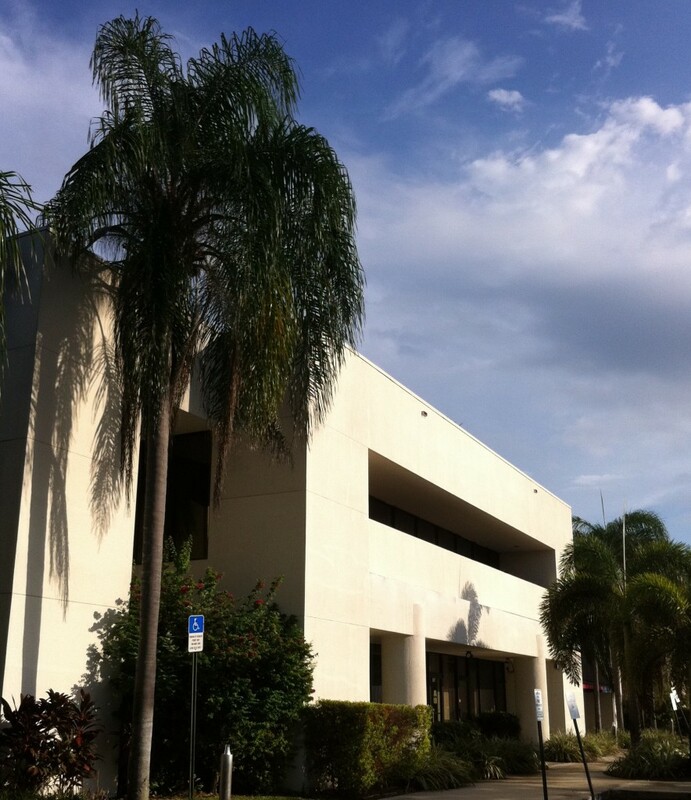 The Suspended Animation, Inc. facility in Boynton Beach, FL. Over the years, SA has developed or modified a variety of equipment suitable for air travel and used for cryonics applications, including portable ice-baths, custom stabilization kits and two patient care and transport vehicles now deployed in California and Florida. SA’s current research and development projects are an automated, air-transportable liquid ventilation device (in conjunction with Critical Care Research) for rapid cooling of cryonics patients; an automated whole body vitrification system (based on a proprietary 21st Century Medicine, Inc. system currently used in animal research), and using cell death gene expression profiling to evaluate existing and new cryonics stabilization strategies. Automated whole body vitrification experiments at SA. Using a polymerase chain reaction machine (RT-PCR) to perform cell death gene expression studies. 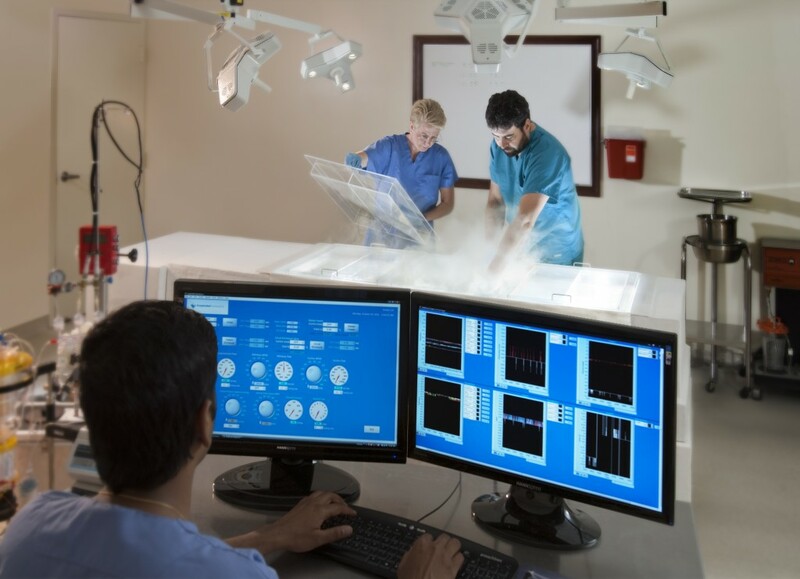 At its facility in Boynton Beach, Florida, SA conducts both research and comprehensive training on the stabilization care of cryonics patients. These standby, stabilization and transport procedures are designed to preserve and protect the patient from the ischemic damage and cell death that occur after pronouncement. Medical professionals from across the country come to learn SA’s cryonics patient stabilization protocol and procedures from SA’s experienced staff. Working in the classroom and then on large animal models, trainees get real-time, hands-on experience and immediately apply what they have learned. They also receive periodic training updates on new equipment and procedures. Those trained then contract to work with SA. Cardiovascular surgeons and cardiac perfusionists are on-call 24/7 to respond exclusively to SA’s cryonics patients. SA’s contract medical personnel also contribute to SA’s research, train new team members and help ensure that SA is kept up-to-date on the latest equipment and techniques available that can be adapted to provide the best care possible for cryonics stabilization patients. Just one example of this is SA’s adoption of the medical device known as the Stockert SCPC mini-bypass system that serves as the air-transportable perfusion system used by SA. SA uses the Stockert SCPC mini-bypass machine to perform washout and cold perfusion for cryonics patients. 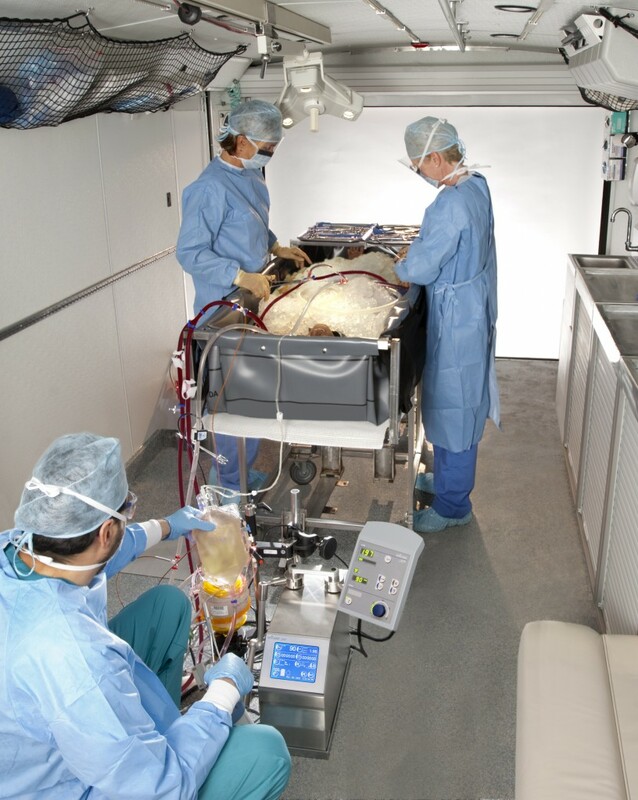 Perfusing a cryonics patient with cold organ preservation solution is a critical component, if not the most critical part, of the stabilization procedure. Rapid cooling helps limit the cellular damage that occurs post-pronouncement until the patient can be transported to Alcor to undergo cryoprotective perfusion and cooling to cryogenic temperatures. Other parts of the stabilization protocol, like applying circulating ice water and infusing cold medications, slowly lower body and brain temperature a few degrees with good cardiopulmonary support. But by surgically accessing a patient’s large blood vessels and connecting these to a cardiac bypass machine that replaces warm blood with cold preservation solution, a patient’s temperature can be dropped to near zero degrees Celsius in about an hour. To do this safely requires careful control of fluid flow, pressures, temperature and avoidance of any air bubbles that could injure the patient. In the top cardiac care centers around the world, cardiac perfusionists use the Stockert SCPC device to manage the blood flow of patients undergoing surgery requiring cardiac bypass. The machine electronically monitors and controls all critical parameters and has built in alarms and backup systems. Combined with a skilled perfusionist, the SCPC system helps to ensure the safest and best perfusion for cardiac patients, and now, for cryonics patients served by SA, including Alcor members. Alcor’s written agreement with SA formalizes a long-standing cooperative relationship between the two organizations. The contract defines three kinds of responses available to Alcor members from SA. First, an “SA-Assisted Alcor Standby” that is initiated, managed and controlled by Alcor but where Alcor may be able to contract individually with some SA team members to assist in standing by for and stabilizing an Alcor member. The second kind of response is an “Alcor-Requested SA Standby.” This is a standby for an Alcor member that is initiated by Alcor but subcontracted to SA, which then manages and controls all aspects of the standby and stabilization of the Alcor member. The standby is subcontracted to SA, which then manages and controls all aspects of the standby and stabilization of the Alcor member. Under the agreement, in the event of an “Alcor-Requested SA Standby” or an “SA Standby,” SA will send its team and equipment to stand by at the Alcor member’s bedside. SA has five cardiovascular surgeons, five cardiac perfusionists and more than two dozen physician assistants, nurses, paramedics and emergency medical technicians to respond to cryonics patients in need. If the member is pronounced “dead,” these medical professionals will leap into action to provide cardiopulmonary support, rapidly infuse protective medications and perform the surgery and perfusion necessary to bring the member’s body temperature down to near zero degrees Celsius. They will also manage the paperwork and bureaucracy necessary to expedite transportation and ensure the patient’s swift delivery to Alcor while maintaining a cold, stable temperature. SA’s latest R&D as well as its facilities and personnel will be showcased, along with many other advances, in its conference, Suspended Animation: The Company and the Goal, May 20-22, 2011 in Fort Lauderdale, Florida. The conference will feature speakers from Critical Care Research, 21st Century Medicine, Nanofactory Collaboration, Timeship and others. More information and registration information is available on SA’s website, www.suspendedinc.com or by calling SA’s Conference Manager, Kelly Kingston, at 800-984-0914. Private tours of SA can be scheduled year round by calling the same telephone number. What do we really know about fracturing? Copyright © 2014. Cryonics Magazine. All rights reserved.